Thursday was an awful day for me. Temper tantrums soaked every bit of the day. Every time I turned around someone was throwing a toy, someone was stealing a toy, someone was hitting someone else and once again the tears started ~ not always tears from the kids either. Naptime came around and there my daughter was yelling and screaming at the top of her lungs beating her tiny yet very strong feet against the back of her door and yelling for Jesus or Daddy to come rescue her from mommy's dreaded naptime. She doesn't sleep in her bed so she doesn't get a good night or day sleep. She sleeps behind her bedroom door on the floor, we can not get her to sleep in her bed no matter what we threaten she just won't. She's a very strong willed daughter which makes her very strong willed momma stressed and worn out at the end of every day. As I type this there are more tears and screaming from both of my children headed off to bed. Maybe their overly tired..maybe they just want to be difficult, who knows. During days/nights like this it's very hard to focus on what was good about the day but a very good friend nudged me to remember the good of today. 1) A friend gave my daughter some new-to-us dresses. They are beautiful. We get all of our clothes from thrift stores and garage sales. Needless to say, my daughter felt like a princess and as she twirled around our living room floor in each new dress, I felt like a very proud momma too. 2) The fact that she tried on each dress (there were about 6) without getting frustrated. 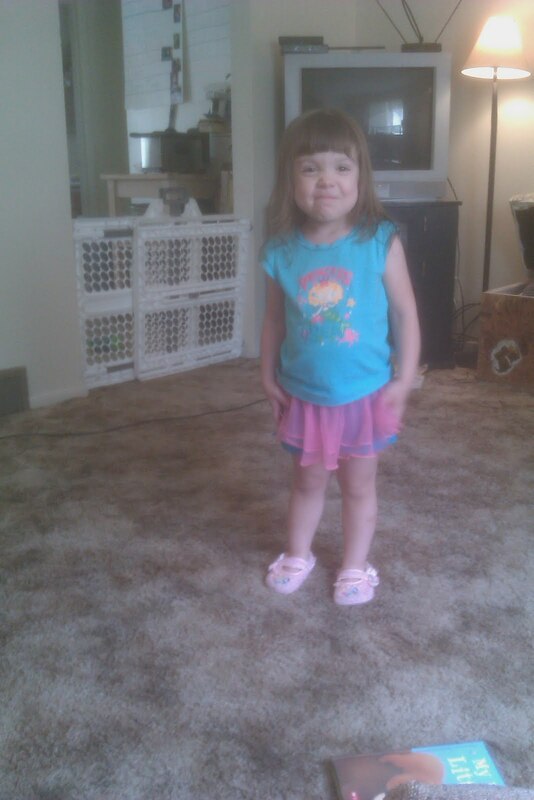 3) The look on her face when she saw the princess shoes, and princess skirt sparkly and beautiful. 4) The kisses I got from letting her try on the dresses and letting her keep the skirt and shoes on for the whole day. Are you a tired stressed out momma? Did you have a bad day? Count your blessings. There are some in each day, you just have to chose to see them. They are there, ask God to remind you. I get so wrapped up in the bad that I forget the good. I never ever want to forget the good things God gives me through my every day. Awe, me sweet little girl! I miss her so much. Hugs sweet Abbie! Each day can bring hardships. But with God, each day can be a blessing. We need to count our blessings and praise God for what He has done. Great post. Lovely and important thoughts! It is hard sometimes to focus on the good when the bad seem to overshadow everything. Here's a thought: What about a strand or two of twinkle lights strung around her bed? The bed instantly becomes a Princess Bed. I saw this on TV once and I think it made the bed extra-special for the little girl. :)It might be thing that gets her to sleep in bed. 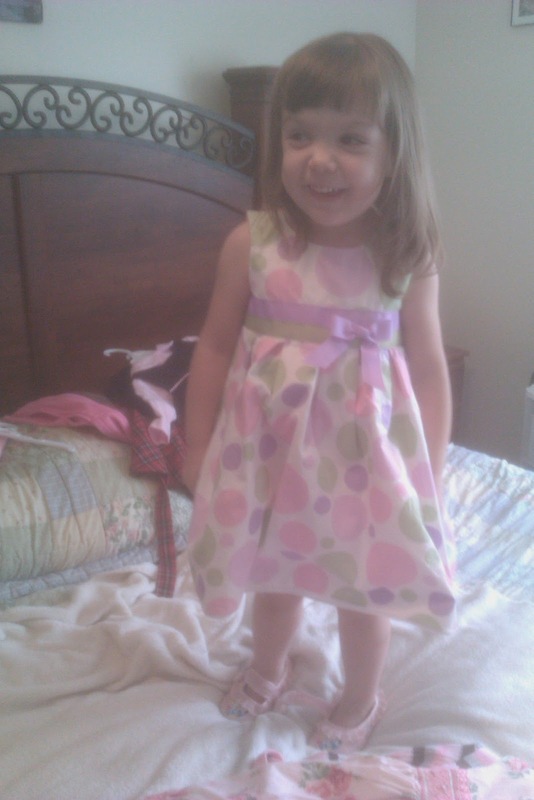 She looks adorable in her dress! What a precious little girl. My kids are 18 and 22 but I still remember some of those early battles. My hubby called 4:00 p.m. "the crying hour" because he'd come home from work and the kids would be crying, or I'd be crying or we'd all be crying, lol! We had some bedtime battles with our youngest. He would not stay in his room at bedtime. I remember being so frustrated and even crying one night because I was soooo tired! Now I would love to just have one more night with my babies, even if I had to be up all night with them. However, that is easy to say NOW when they're grown, lol!, because I do remember how exhausted I was back then sometimes.